[06/13/2018 @ 7:49 AM] Book this fare on: Hotwire, BookingBuddy. 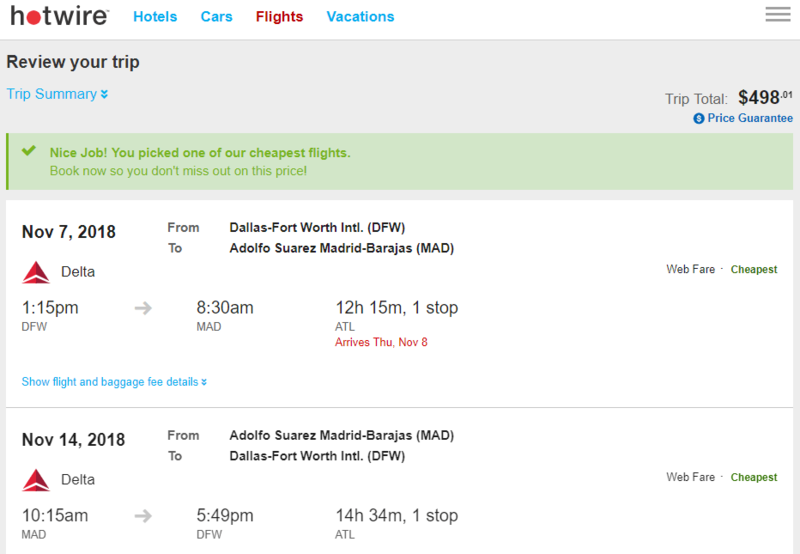 Hotwire has round-trip flights on Delta from Dallas (DFW/DAL) to Madrid or Barcelona (MAD/BCN) for $477-$513 with a connection. Flights from November to March. Expect prices to fluctuate by +/- $20. Flight may operate as a Air France/KLM code-share. Example Dates: (Hotwire / BookingBuddy) Oct 24 – Oct 31 / Oct 31 – Nov 07 / Nov 07 – Nov 14 / Nov 14 – Nov 21 / Nov 21 – Nov 28 / Nov 28 – Dec 05 / Dec 05 – Dec 12 / Dec 11 – Dec 18 / Dec 30 – Jan 09 / Jan 02 – Jan 09 / Jan 09 – Jan 16 / Jan 16 – Jan 23 / Jan 23 – Jan 30 / Jan 30 – Feb 06 / Feb 06 – Feb 13 / Feb 13 – Feb 20 / Feb 20 – Feb 27 / Feb 27 – Mar 06 / Mar 06 – Mar 13 / Mar 13 – Mar 20 / Mar 20 – Mar 27 / Other dates: There are more dates available than the ones we list here, experiment on your own. I was able to pull this fare up on Hotwire. Screenshot taken at 7:49 AM on 06/13/18.